Despite tougher financial times, Waitomo farmers Euan and Claire Reeve have maintained a strong focus on genetic gain in their herd. It’s something they know will prove worthwhile through periods of both low and high milk prices. The Reeves’ 370-head jersey herd consistently ranks in the country’s top five percent for Breeding Worth (BW), with a herd average of $114 against the national median of $66. Euan says the first step in this success is using artificial breeding (AB) on his heifers to leverage off the high genetic value already in those younger animals. This accelerates the rate of genetic gain they can bring to the entire herd. He mates his heifers to Livestock Improvement Corporation’s (LIC) premier sire bull teams. 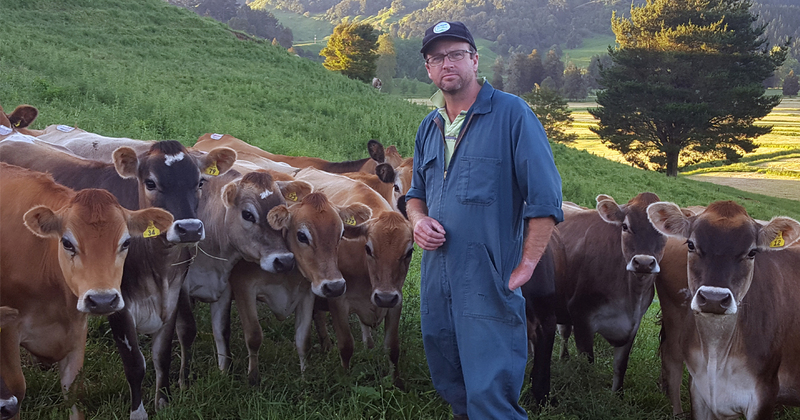 The program delivers on average an extra 15-20 heifers in addition to the herd’s replacements, and contributes significantly to Euan’s surplus heifer stock sale income. When it comes to choosing sires, Euan’s emphasis is on BW, followed by protein, milk volume and udder values. You do get those freaks of cows that may have a low BW and high production. But as a whole, BW indices do match the reality of how well a cow can do. Herd mating is a ranked process on Euan’s farm. His top six cows are contract mated by AB companies as potential bull mothers. The next bracket of 30-40 percent, or about 140 head, are custom mated through LIC’s Customate programme. “To qualify, she has to be among the top ranked BW cows in the herd and have calved in the first six weeks,” says Euan. Most of the remaining cows are mated to LIC’s premier sires, with a few of the very lowest cows going to hereford bulls. The Reeves carry out herd testing four times a year to “paint the picture” on performance. They also assess two-year-olds for traits other than production (TOP), such as udder quality. “It’s good to have on-the-ground data on their traits to compare against parent averages,” says Euan. He also weighs the herd once a year to get an indication of milksolids to body weight efficiency. Routine herd testing and weighing gives the Reeves a good handle on the performance of individual cows. That combined with careful parentage records results in accurate BW estimations for heifer replacements. Euan visits the springer mobs regularly throughout the day during calving, and staff are constantly reminded about the importance of good record keeping. Euan encourages them to speak up if they’re not sure about a match. The sale of surplus AB heifers and bulls amounts to income of $1/kg milk solids and has become a valuable part of the farm business. Euan feels the BW index is delivering the gains he hoped for. Breeding Worth (BW) is the index used to rank cows and bulls based on how efficiently they convert feed into profit.